Tickets are expected to sell out again this year for the community beer and wine festival, which takes place from 2 to 6 p.m. and also features discounted cuisine, musical entertainment, and complimentary trolley rides. The event will host an impressive selection from more than 25 different craft breweries, boutique wineries, and cider houses that will be serving up samples in the event’s signature souvenir glass at participating businesses between Temple and Hermosa Avenues. Many of the restaurants along the corridor will also offer $4 to $6 specials to compliment the sips. Far Outfit shopkeeper Johanna Moynahan said Pour on 4th’s success so far really showcases the positive momentum the business district has right now. Retro Row’s business owners have mobilized this year to offer monthly Fourth Fridays events as well as rebrand the street with new pole banners, murals and other features. “This really is a community gathering place, where everyone feels welcome, and it’s our pleasure to host these events that bring residents and businesses here together,” Moynahan said. Tickets include a wristband and sampling glass per person. Presale tickets to Pour on 4th are $35 online through BIT.LY/POURON4TH. The event is expected to sell out in advance, so get your tickets today because there may not be any available at the door. Proceeds from Pour on 4th will go towards Fourth Street Business Association projects such as beautification and cleanup efforts, other community events, and the continued promotion and marketing of everything the Retro Row corridor has to offer. 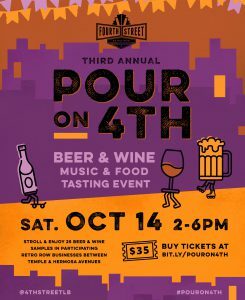 Sponsoring partners for Pour on 4th include: Ballast Point Brewing & Spirits, Beachwood Brewing, Bianchi Vineyards, Bootlegger’s, Brouwerij West, Coronado Brewing, Donati Vineyards, Epic Wines & Spirits, Founder’s, Golden State Cider, Hangar 24 Craft Brewery, Lagunitas, Maddalena, North Coast Brewing Company, One Hope Vineyards, San Antonio Winery, San Simeon, Schilling Cider, Unibroue, Wine Warehouse, Young’s Market, and Trolley rides provided by the Big RED Bus. Fourth Street, or Retro Row, is a business corridor that stretches along Fourth Street between Hermosa and Temple avenues and encompasses more than 50 independent merchants featuring vintage and contemporary wares. Restaurants, wine bars, coffee shops and the historic Art Theatre also add to the diversity of what’s offered in the neighborhood. For details, visit 4thStreetLongBeach.com and follow us on Instagram, Facebook and Twitter.